Portable solution for the modern studio. Arturia are excited to announce the imminent release of MiniLab MkII: a space-saving, high-quality controller that's perfectly suited to small home studios and musicians on the move. Powerful performance pads: record a drum pattern, launch clips, cycle through presets; MiniLab MkII's eight multi-purpose pads are ultra- responsive and RGB backlit, helping you easily identify the sound or function they are controlling. Record your songs: Ableton Live Lite an introduction to arguably the most popular, intuitive recording & performance software on the market is now included with MiniLab MkII, meaning you can record and produce your songs straight out of the box; thanks to dedicated pre-mapping within Ableton Live, it's never been easier to take control. Amazing keyboard sounds: the included Analog Lab Lite software gives you access to hundreds of iconic preset keyboard sounds taken from Arturia's award- winning V Collection 5 from electric pianos to analog monosynths, string machines to modular monsters, and everything in between. A famous piano at your fingertips: a beautiful, ultra-realistic piano sound is always useful, and that's exactly what you get with the included UVI Grand Piano Model D software meticulously sampled from a classic Steinway, and yours with MiniLab MkII. 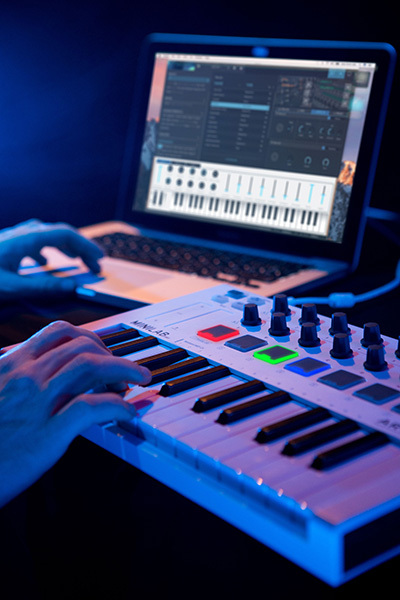 Tempting upgrade paths: whether you want thousands of extra keyboard presets with Analog Lab 2 or need the unparalleled control of Arturia's flagship V Collection 5, owners of MiniLab MkII will be entitled to exclusive upgrade offers.